With a Fall/Winter movie season bringing a healthy dose of “period dramas,” Brooklyn has the youngest lead actress by far but, she gives a youthful yet layered performance in this transitional role for her career. 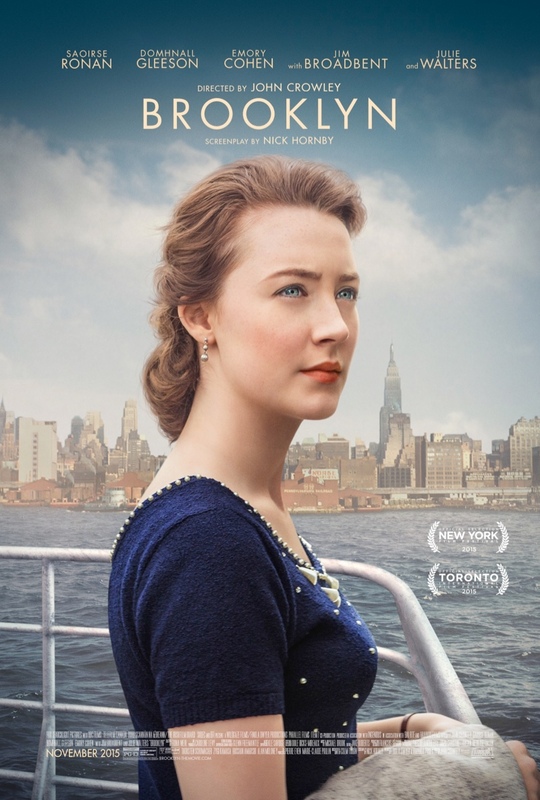 Brooklyn is the tale of a young Irish immigrant, Eilis Lacey (played by Saoirse Ronan), who makes her way to New York City in the 1950s to visit her mother’s home. While there, she gets swept up in a love connection that strips away her homesick woes and makes her contemplate returning home. However, a blast from her past ultimately leaves her with a choice between her new and old life. The film is beautifully designed and shot with great period costumes, style and location. Saoirse is developing a lot of Oscar buzz for her work in this movie and in my eyes it’s deservedly so. She gave a captivating and passionate performance that has definitely set the tone for this mature transition in her career. Jasmine Kantor (from College Times): I was just wondering, how emotionally invested do you think you were in the character of Eilis since you and her both come from New York and Ireland? Saoirse: I mean initially the real personal connection for me was the fact that my mom and dad had made that trip over from Ireland to New York and had gotten married in city hall just like Eilis and Tony did, and I was born there. Yes, these two places very much made up who I am. By the time we actually made the film, which was maybe a year or so after I had signed on, I had moved away from home and was living in London and going through home sickness myself and still trying to figure out where I stood in the grown-up world. It’s a very daunting feeling, I think. I was right in the middle of that while we were making the film, so it meant that every kind of stage that we see Eilis reaching and overcoming, I was going through myself. It was very scary because of that, because there was sort of nowhere to hide, but by the same token, once you actually get through something like that there’s nothing more gratifying. Kate Marquis (from University of Missouri-St. Louis): This is your first role or one of your first roles playing an adult woman in a coming of age story where she’s adapting to a new country, could you speak about the role and the character, and how you feel about moving beyond juvenile roles? Saoirse: I mean it’s interesting because even when I was a kid, I never was involved in children’s films apart from maybe one or two. They were always quite grown up, so when I got to the age of about 18 and 19, I was really ready to play someone older, and certainly by the time I reached 20. It’s a tricky time because there are a lot of [executives] and writers and studios and all the rest that can’t really pinpoint exactly what a journey would be for a young woman between the ages of 18 and 21, so it’s a tricky time to get the role that is interesting and still kind of matches your maturity and where you’re at in your own life. When Brooklyn came along, it was perfect, and it was like a bloody guardian angel or something coming down and kind of going, “Okay, you’re ready now.” I think just going through that experience, I felt quite changed afterwards, but I was very much ready to take that step. Dorothy O’ Donnell (from Academy of Arts): I was wondering how the director, John Crowley, helped you bring her character to life in such an authentic way. Saoirse: John, who has done an awful lot of theater in the past, kind of grew up with theater, was incredibly tuned in to every single emotional beast that needs to be [indiscernible]. We didn’t really deviate from the script at all. We stuck to it word for word pretty much because it was such a terrific script, anyway. Ultimately, when you’ve got a script that’s so well written and you’ve got a great director who knows where he wants to take it emotionally from scene to scene, it’s a great guideline to have. But I think with John, what he would do was he would start sort of emotionally in one place, and then he would bring you somewhere completely different. He would always try and find this great balance that meant that everyone’s performance is natural and quite nuanced, and as you say, it’s sort of delicate, it’s not over the top or sentimental or anything like that. I think it’s because he knew every single step that this woman took was important, and it was integral for the story and for her progression. And so you knew that you were in safe hands because dramatically, he knew where he needed it to go even when we were shooting. Izling Makentaguard (from Lynn University): Hi, Saoirse. My question is, Eilis experiences some conflict regarding her future when she returns to Ireland, what do you think was like the ultimate deciding factor in her decision to return to New York? Saoirse: Being honest, I mean we gradually start to say when she goes back home to Ireland that even though she has evolved into the young woman who has her own life, has her own job, is married, even though nobody knows that at home, decisions are slowly starting to be made for her again, Well, actually as soon as she comes home, her mother automatically starts to take ownership over plans with her friends and the job that she’s going to take up and things like that. And so she can see that that’s starting to happen but doesn’t necessarily do anything about it because she’s home and she’s kind of falling back into the sort of fantasy, I guess a little bit of what it would be like if she were back home. Really it’s when she has that scene with Miss Kelly near the end of the film where really—when you were married back then, divorce wasn’t an option, that just wouldn’t have happened. And so, for Miss Kelly to catch Rose and try and—I don’t know what she was trying to do—bring her back down to earth or remind her of where she really came from, she had to rise up and she had to stand up to this woman who had kicked her down for so long and profess who she was and the life that she had chosen. It’s really at that moment that she realizes that this can’t last forever, and she needs to go back to this life and his man that she had chosen before she left. Kayla Dungy: I was just wondering what it felt like filming so close to where you grew up? Well, I know some of the scenes were shot in Ireland, so what was it like filming so close? Saoirse: It was weird. It was really weird. We actually shot in Enniscorthy where the book and the film were set, and Colm Tóibín, the author, is actually from there. To go there, which is like 25 minutes away from where I grew up in Carlow, and it’s a place that we used to go to the cinema when the film that we wanted to see in our one-screen cinema in Carlow wasn’t on, we would go to Enniscorthy. I knew the faces there, they were quite familiar to me and there were a lot of extras who would be in the dance hall or at the church, and would come up to me and say like, ‘do you remember me from years ago? We played basketball together or were at sports together.’ These were people that I wouldn’t have known personally, but kind of met in passing. To have a life that even I’m not part of anymore, that was very much my childhood colliding with work which had always been kept so separate when I was kid was bizarre and amazing. It was really amazing. It was great to be surrounded by really kind of Irish characters. This wasn’t imitated in any way. We were surrounded by the Irish spirit, so I think it really helped the film. Trent Lira (from University of Houston): You’ve done a very eclectic mix of films and now developing into more mature roles, what do you look for when you’re considering a script and what attracted you to this script specifically? Saoirse: I think one of the really important things for me, and it always has been, is that I’m always doing something different. The project that I’m looking at for the future needs to be different to whatever I’ve done in the past. Obviously, you can’t always make a dramatic change, but I feel like you need to do that as much as possible in order to grow and learn more and just being able to really adapt to different types of personalities that you’re playing. What I’ve found more as I’ve gotten older and where I’m at personally kind of at this stage now in my life, it’s important for me to play someone who maturity-wise is at the same kind of place. It’s always important that they’re not just the crutch to somebody else’s character, that they’re interesting and well written and intelligently written. I would never want to play someone that’s just the girl next door or something like that, I’ve never found that interesting. I’ve always kind of thought when I look at the likes of Cate Blanchett and Tilda Swinton that so many of the roles that they’ve taken on could have easily been a man, and it could’ve been a male character because it’s not necessarily gender specific. It’s very much just about this person that they’re playing, and so that’s kind of what I’d like to emulate too. Brooklyn is in select theaters now! Thank you to Moroch and Coog Radio for the opportunity to interview her.